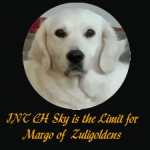 Int Ch Sky’s the Limit for Margo of Zuligoldens is one of our newest English Retrievers. She was imported from Europe. We wish to Thank Dr Alexandra Karanpandiz and Djokic Zoran for allowing us the privilege to add this beautiful female to our breeding program. Her father, IntCH, HCh, CroCh, SkCH, MacCh, SrbCh, and SrbJCh Shamrock Stormy Skies, has multiple championships from many countries. Her mom is also a champion, so Margo has it in her blood. 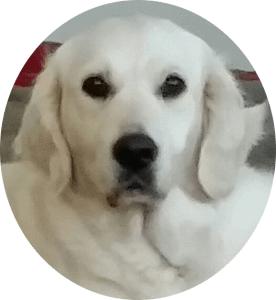 She has a fantastic pedigree from top show kennels in Europe, along with top health clearances and a great temperament. She is a fabulous mother and has such a loving warm temperament. She wiggles when she sees you and her pups have that same sunny disposition.. They also are very smart and learn fast. Margo is a champion in three countries and also has a working title, as all Champion from Europe have to have to be a Champion. We will be breeding her in the fall to our Champion Time Traveller of Golden Duck. You will so want one of these English Golden Retrievers.